The printer can be used to print photos from any Android and iOS devices, using its app. It supports WiFi, WiFi Direct and NFC transfer protocol. 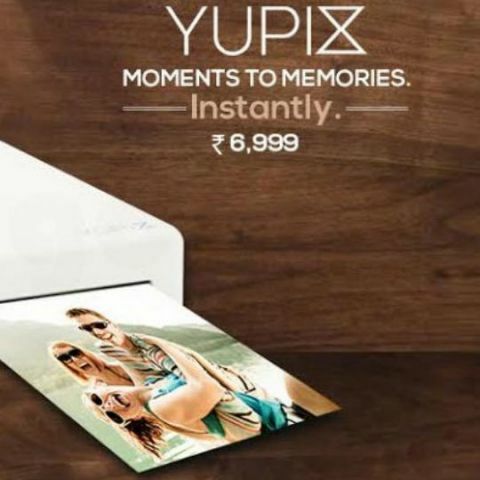 Micromax-owned Yu Televentures has launched a pocket-sized portable photo printer, YuPix, priced at Rs. 6,999. It can be used to print photos from any smartphone without using the PC, by installing the YuPix app which is available for both iOS and Android platforms, and connecting it to the printer. It is available exclusively on Amazon India. It has dimensions 2.99 x 6.01 x 0.94-inch, and weighs 272 grams. The printer uses Dye Sublimation technology for printing photos, and is capable of printing photos of 54 x 86 mm size with a resolution of 291dpi. It comes with a 750mAh rechargeable battery. The company has also claimed the product to be waterproof. The YuPix printer supports WiFi, WiFi direct and NFC for transferring photos from a smartphone to the device. As claimed, it takes about 60 seconds to print one photo, and can print up to 10 copies in continuation. The printer uses cartridges integrated with Ink Ribbon and Photo Paper, which includes ink as well as 20 print sheets. Apart from just printing photos, one can also use the Yupix app to edit photos. It is not the first time that Yu, which started with making smartphones, has tried its hands on other products. Earlier, it had launched YuFit and HealthYu, in health and fitness tracker segments. While the first one is a fitness band, the latter is a cassette-like device which sticks to the back of a smartphone. The company has also sent out media invites, possibly for the launch a new product at an event to be held on September 8.
should i buy meizu m2 over yu yuphoria ?